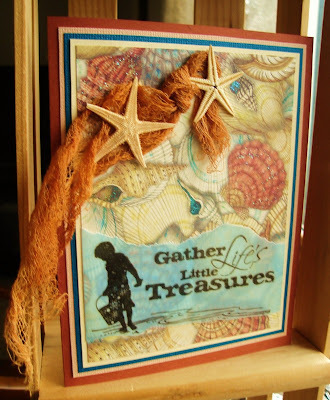 Today I’m adding my Shells card to this challenge. 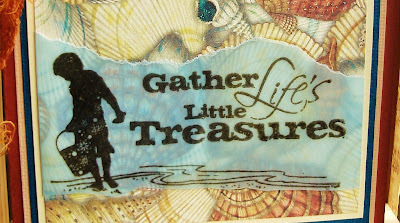 I stamped and embossed this image on blue vellum, added Star fish and gauze (cheese cloth) which I die with distress ink, added some glitter. Hope you will join us at FSC (Fashionable Stamping Challenges ). Totally gorgeous, Vada! Another stunning piece! This is an absolute treasure, Vada! 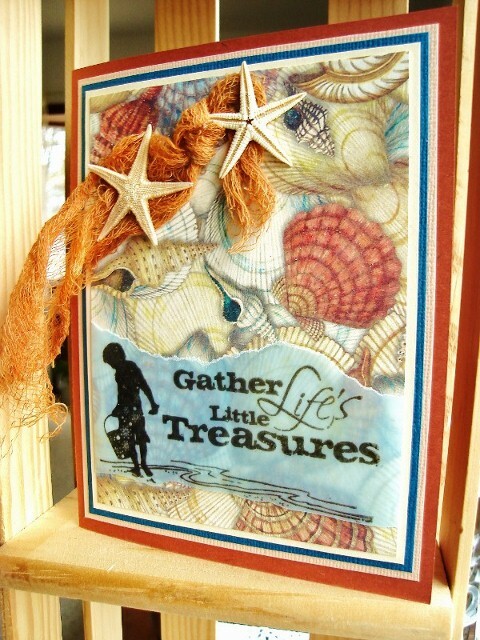 Fabulous card,all the shell and net details look amazing. The sentiment is is lovely as well.Thankyou for joining us at FSC this time. Stunning! 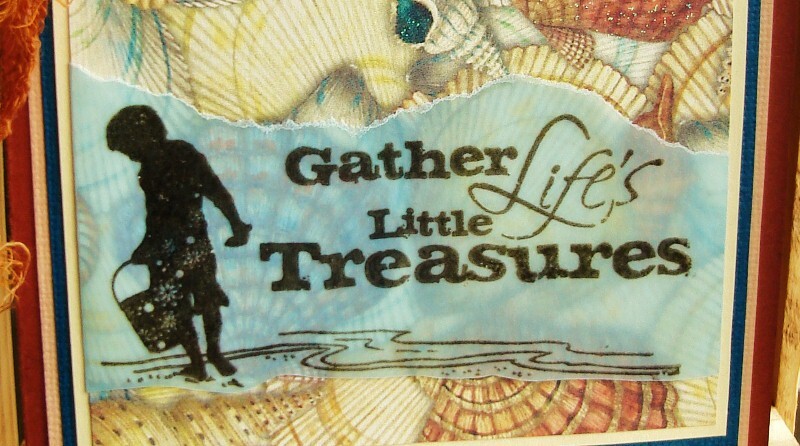 Love the rich colours and the stamping and whole design is amazing. Gorgeous work! Beautiful! Love the netting and that image of the child searching for treasures. A fantastic card with wonderful elements, really love it. By the way... the Word verification is really time consuming, there are two words to read and write... It would be great if you could switch off this. Thanks in advance. WOW, a striking card with choice of colour, stamps and embellishments. Thank you for sharing this stunning creation with us at FSC. I saw this at FSC and thought I had already told you how incredible it is! 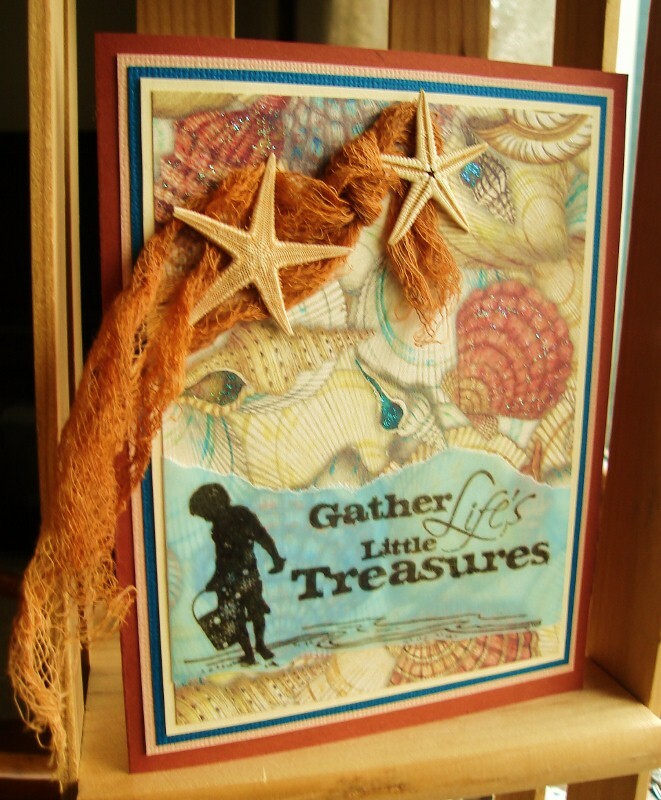 I love the scene you created and the netting and starfish are just perfect! Amazing, Vada! Hugs! Wow, I love this. Really, really makes me long for the beach . . .or even just someplace warm right now, lol. The guaze usae is brilliant! I love this card too - it's SO gorgeous. Beautiful card! It's so gorgeous! Thanks for joining us at Fashionable Stamping Challenges! PS would it be possible to turn word verification off? Vada, I think that this is the most stunning card ever - it is absolutely beautiful!I have joined you as a follower but find your word verication really hard to complete! 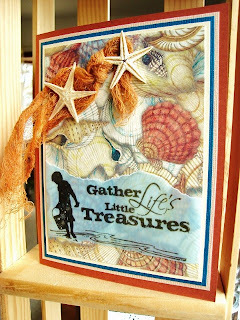 Friend http://annachristensencrafts.blogspot.com/ shared your fabulous card post with me yesterday. It was so lovely, I had to recreate it, putting my spin on it! Thought you might like to see what I created, giving you full credit, of course! Have you seen the catwalk at FSC? Shirley overlooked this one, but you were my winner!